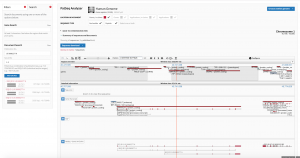 The PatSeq Analyzer is a modified genome viewer tool that is now a stand alone facility but links to PatSeq Explorer to give you a full view on a patent sequence details. It is based on the open source HTML5/SVG genome maps browser by the Computational Medicine Institute, Prince Felipe Research Centre, Valencia, Spain. 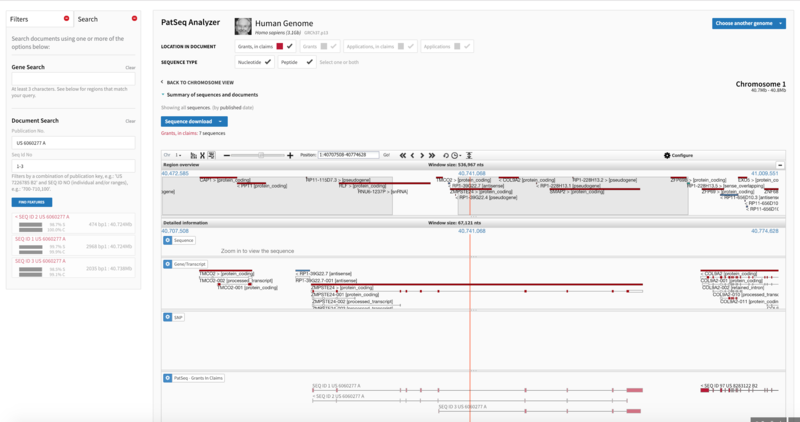 The Analyzer allows you to zoom in to the details of particular patent sequence entries mapped onto a gene region, refine mapping position, and compare all patenting trends within that particular mapping position either at a gene region or at the detailed sequence level. The Analyzer also enables free sequence downloads. In addition to the dedicated patent sequence tracks available in PatSeq Analyzer that are based on sequence type and sequence location within patent documents, the app provides feature tracks from public genome annotation datasets (including SNPs and gene/transcripts). The tool also provides a gene and SEQ ID search capability wherein you can locate a gene of your interest on a specific chromosome and analyze or even predict patenting activities around it or search a SEQ ID range based on patent and SEQ ID numbers. For example see below patenting activities surrounding BRCA1 gene on Chromosome 17 of the human genome using mapped sequences that are either referenced in the claims of granted patents or simply disclosed in granted patents. All tracks are modular and can be turned on and off. Conversely, all views in PatSeq Analyzer are embeddable. On the left of the PatSeq Analyzer are a large number of collapsable filtering and searching options. These include filtering results by % Similarity, Coverage, Sequence Length, Declared Species or by document years and/or jurisdictions. You can search for specific publication numbers, sequence ID numbers, gene names, or SNP names.